Hudson’s Bay popular ‘One Day Sales‘ are back! 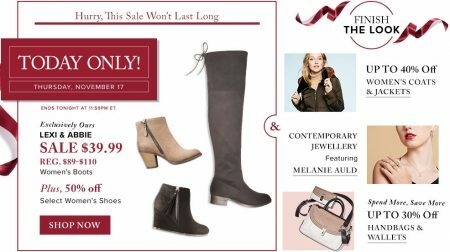 Hudson’s Bay will offer deep, one-day only discounts on various products that are perfect for the holidays from November 9th to December 20, 2016. Each one-day promotion will begin at 12:00am EST and will end at 11:59pm EST that same day or while quantities last. Visit TheBay.com for the latest sales each day.